Panopticon was written for Auer Hall at Indiana University, resulting from countless recitals I heard in that space, including recitals of electronic music on which my own works for multichannel sound were performed. I began to wonder how simulating the three-dimensional compositional procedures common to electronic music might sound using acoustic instruments instead of loudspeakers. Positions of the clarinets around the audience and conductor. Scored for twelve clarinets, the positions of the instruments and conductor loosely resemble Bentham’s panopticon. Here, the individual clarinetists are analogous to the inmates of a prison, the conductor functioning as the watchman in the tower; keeping a close eye on everybody despite that the inmates will never see their guardian or know exactly when they’re being watched. Michel Foucault posits this arrangement as the panoptic society in which we live; the ideal modernization of punishment, prison itself being only one in a large network of sovereign institutions — schools, factories, hospitals — that conditions its citizens. This renders the panoptic society according to its classic “visual surveillance” terms, but an extension of this principle is offered when considering other forms, such as sonic surveillance. The philosopher/musicologist Peter Szendy explores this possibility in Sur écoute. Esthétique de l’espionnage (2007) in which he traces a lineage of auditory surveillance across history, through spy movies. In an acoustic panopticon such as this arrangement of clarinets and conductor, not a single instrumentalist knows where the conductor’s ears are focused at any given moment — if they’re being “watched” or not. But, “Dissymmetry is always reversible,” Szendy warns us. 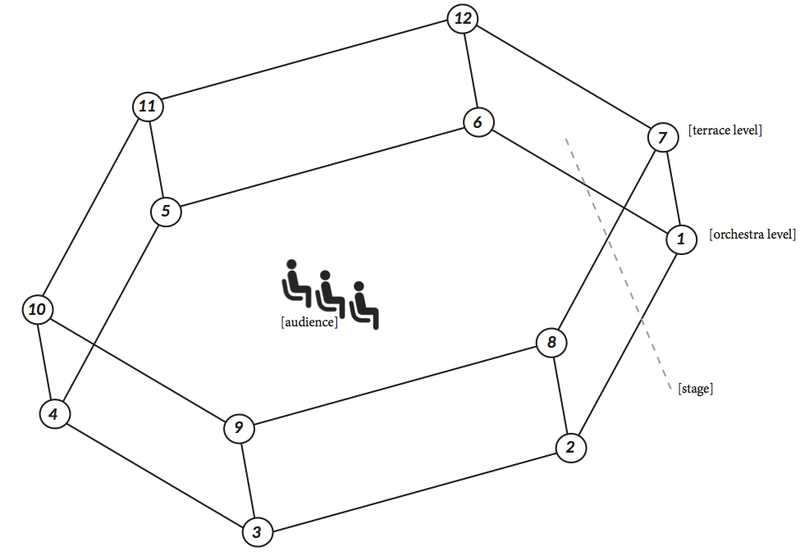 This “panacousticon” offers “infinite points of exteriority,” where listeners can tap each other, and where there is no longer a single point of control or authority. Surveillance in the acoustic domain is, therefore, a dangerous game. The pitch material for Panopticon is mostly drawn from the analysis of bass clarinet multiphonics. The opening presents one multiphonic analysis cast as a series of pulses whose polyrhythmic ratios are proportional to its frequency ratios, a technique inspired by the music of Yan Maresz. This texture is interrupted by another multiphonic and ensuing sonorities based on its analysis. These sonorities follow one another throughout the piece as new rhythmic elements are interspersed throughout the texture. Sudden, invasive memories of Iraqi jurjina and Bulgarian kopanitsa rhythms evoke the clarinet’s rich and varied history as integral to these genres.